I have a thing for Ramos Fizzes. I love them. I've said that before, but it bears repeating because this is my St Patrick's Day riff on two New Orleans classics, the Ramos Fizz and the Absinthe Frappé. It's really more of a Fizz than a Frappé and there's no orange flower water in the recipe, which kind of defines a Ramos. They were my inspiration because if there's ever a city for celebrating St. Patricks Day, outside of NYC, it's The Big Easy. I played a LOT fast and loose with the ingredients, well sorta. Just remember I'm not calling this any kind of Ramos or a Frappé and those aren't very Irish names anyway. DIRECTIONS: Chill your glass. Add all the ingredients except the ice to a blender and blend for 25 -30 seconds. Add the ice to your shaker, transfer the drink from the blender and shake for 30 seconds more. Pour into your Collins glass, top off with soda, garnish, add a straw and serve. 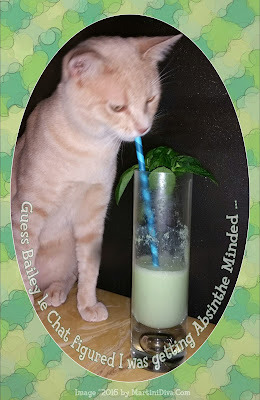 *Here's a great recipe for Basil Mint Syrup. I cut it in half and used equal amounts sugar and water for a slightly thicker syrup. 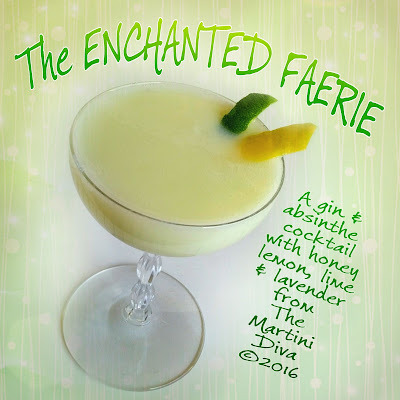 Tales of woodland fairies are rampant in Ireland so when I decided to do a green cocktail for St. Patrick's Day the liqueur that came to mind was absinthe. Often referred to as the Green Fairy, Absinthe is an herbal liqueur with a strong presence of licorice flavor and it goes very well with a nice botanical gin and fresh lemons. 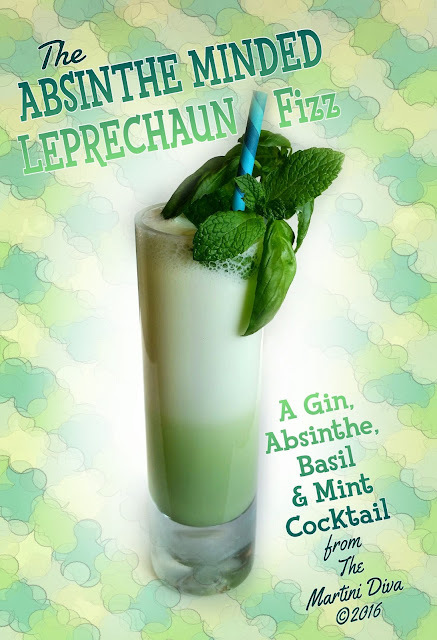 It makes a pretty soft green cocktail as well. Exactly the color of fairies wings. This is a decidedly herbal drink, with lovely lemon notes, a touch of woodsy floral from the lavender and a soft sweetness from Honey Ridge Farm's Honey Créme Lemon, and it's beautiful as well. *Prepare the Honey Créme Lemon Syrup by combining a tablespoon of water with a tablespoon of Honey Ridge Farms Honey Créme Lemon. (Trust me, you WANT this honey!) Nuke this for 15 seconds and let cool. Add the gin, lemon juice, lime juice, lemon creme syrup, absinthe, egg white and lavender bitters to a cocktail shaker. Cover and vigorously dry shake the ingredients for 30 seconds to a minute to emulsify and build the foam. Add the ice to your cocktail shaker then shake vigorously again until chilled. Strain into the chilled glass, express the lemon twist over the top, garnish and serve. 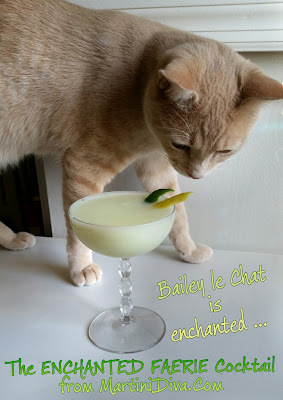 Watch out for cat enchantment.